Before I started taking light measurements and stuff , I wanted to take the UF1401 for a walk . The walk as it turns out is around 4 kilometers which is a fair distance . Putting the UF-1401 on the scales with 4*18650 inside I got some 635 grams . Ouch ! and the bummer is the UF1401 has no attachment points , none ( The UF-1401 begs a sling ) . So either put it in a bag or carry it around in your hand ( Which I did - carry it about in my hand ) . Walking about and using the UF-1401 I quickly found most of the lights short comings , the on off / mode button is just a little too flush to give any sort of feedback when wearing gloves . 3 Output modes are not enough , LOW is too low for the suburbs , MEDIUM is too high and High is embarrassingly high . Which brings me to the order of the modes , the light always starts in HIGH . With a light that produces as much power as the UF-1401 the light should start in LOW . Also the way the light starts ( Hold the switch down for about 3 seconds ) is cumbersome and slow . I understand that this has probably been done to stop accidental activation , but all one needs to do in that regard is untwist the body to effectively lock out contact ( flow of current ) . The UF-1401 does one thing really well . It pumps on high , it does not have huge throw but it does have huge flood and out to maybe 150 meters , there is no where to hide . Seriously I think you could play a football match with two of these lighting up the field . The UF-1401 really begs 2 more light levels . There needs to be something between LOW and MEDIUM around 80 to 100 Lumens and another light level between MEDIUM and HIGH because the gap between medium and high is just massive . This is most likely what most readers are interested in so I wont keep you waiting . The light really needs more light levels . 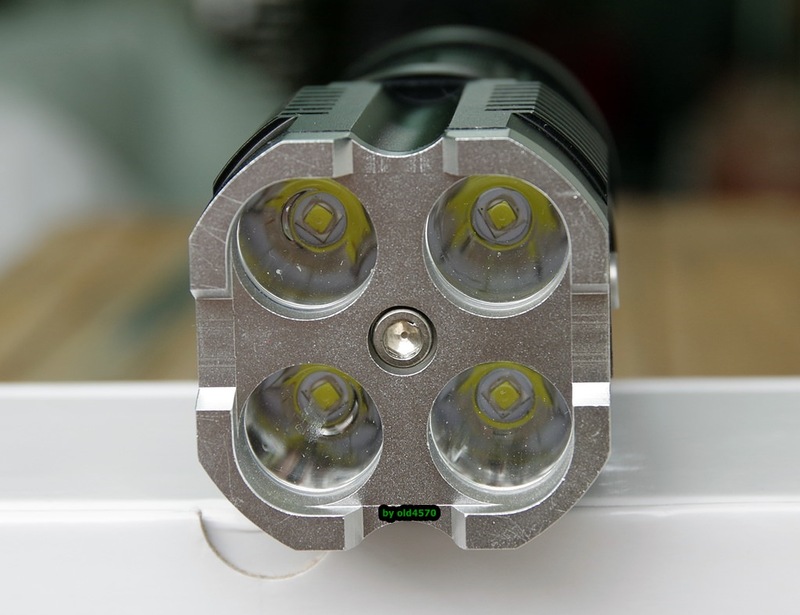 I have found around 80 Lumens to be about right for walking in the Suburbs and the gap from HIGH to MEDIUM is just simply too massive as is the gap between LOW and MEDIUM . There really needs to be another light level around 1000 Lumens . 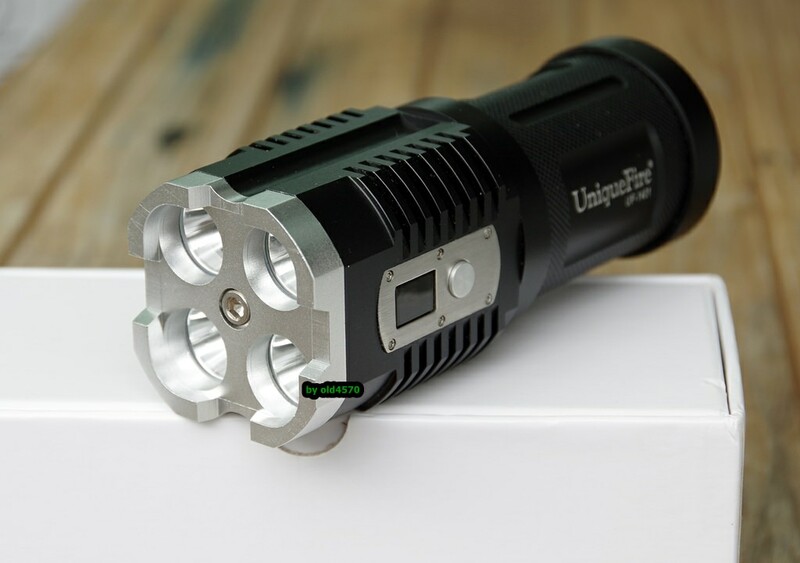 The UF-1401 is really begging to be a 5 light level flashlight . Flashy Modes : These are thankfully hidden and what ever light level you are on , just do a quick double click and you will start in SOS . Another double click will take you to strobe . ( SOS > Strobe > SOS ) . A single click will exit you back to your last light level , or if you press and hold the light will turn off . LED Readout: The UF-1401 is equipped with a LED read out to let you know the state of your batteries , as well the light level your in (?) . Actually the read out to let you know the state of your batteries is very nice . A 9 means 90% or better ( to 100% ) and a 8 means 80% or better ( to 90% ) and 7 means 70% or better ( to 80% ) . On receiving the light I simply could not get it to work . I knew what the problem was , the battery tube was not making contact with the head to complete the circuit . I have some silicone grease handy and after lubing the threads the battery tube screwed on with no issues . The anodizing is nice and even and looks to be well done . Cant complain about the machining and so far there have been no issues of any kind ( except for needing lube on the threads ) . Shaking the light like a rabid monkey there are no funny noises , no battery slop . Build wise it looks like UniqueFire has done a good job . 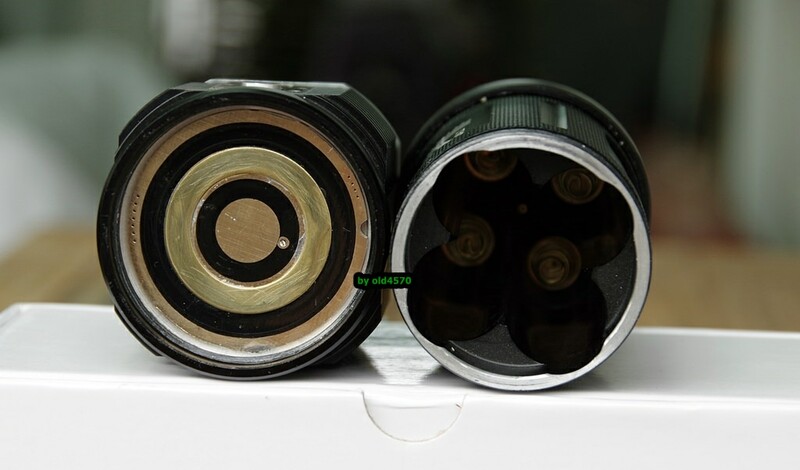 The build quality on the sample received for review is good , not Nitecore good , but good and yes the threads needed Lube but that's no deal breaker . The light Pumps putting out a relatively stable 2800 Lumens ( in my light box ) with my batteries and it never got more than lukewarm . I guess all that heft is good for absorbing and dissipating the heat generated by 4 emitters . The light is heavy and it should have come with some sort of attachment point so that perhaps a sling could be used . 3 light levels just don't cut it . Ok 11 lumens ( LOW ) is really a good light output for dark places like forests where you perhaps want just enough light to walk bye , but in urban environments you want something around 80 Lumens . Medium is a little too much if you care about other people around you , but I have always liked an output level around 500 Lumens . There has to be something between 465 and 2800+ , it's just to big a gap . And such a powerful flashlight really wants to start from LOW and work it's way up . The styling is amazing , the UF-1401 really looks the business . I love the flood , it is simply amazing . Did I mention that out to around 150 meters there is just no where to hide . ( Might make for a decent hunting light ) And one need not be afraid to run HIGH for several minutes as the light did not seriously heat up for me when I and my friend ran it for several minutes on high . Is well made when considering the price point . Hidden flashy modes - Really nice . 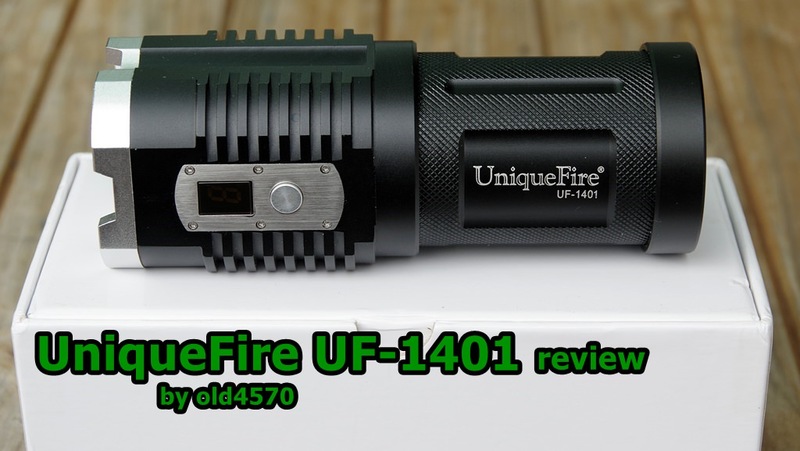 Now you might look at the UF-1401 and for a moment think that it might make a decent club ! And I would hesitantly agree that defensively ( one hopes ) the UF-1401 might be capable of cracking open a coconut . Well if one was inclined or needed to crack open a coconut . The aluminum bezel is certainly hefty for purpose . It does how ever block a fair amount of light and I just wonder if it can be taken off . ( Just checked ) I does seem to serve a purpose , holding the reflectors and lenses in place .